The first plots of turfgrasses were planted at the New Jersey Agricultural Experiment Station in 1923 by G. W. Musgrave. Bentgrasses were evaluated in this test. In 1925, experimental plots were planted with financial assistance from the United States Golf Association Green Section. A 1928 report on this work is of interest: In these times with modern irrigation systems, you might be interested to know that the maximum equipment found on these early plots were some 3/4" and 1" underground pipe that supplied water with a hose and movable circular sprinklers that worked quite well with low, variable city water pressure. During the late 1920s, Dr. Howard B. Sprague, as Agronomy Dept. chairman, and Dr. Ed Evaul, as the first full-time turf professional, became involved in the turf program. In 1928, serious and widespread turf failure on golf courses gave great impetus to the turf program. The first turf course followed during the winter, and the State of New Jersey appropriated special funds in 1929. Out of this work came the lime studies which showed highly acidic soils were more conducive to turf failure in summer, studies which gave us basic information on the nature of annual bluegrass, and studies which demonstrated that turfgrass could be grown on most any soil with proper liming, fertilization, addition of organic matter, and choice of grass. At this same time, arsenate was used for grub control which showed this chemical prevented development of such weeds as annual bluegrass, chickweed, clover, and crabgrass. In 1929, specific lawn seed formulae were released by the New Jersey Agricultural Experiment Station to combat unsavory practices in the turf seed market. Some of you may still hear the terms lawn seed mixture No. 1 or No. 4, which are carryovers from that program which continued until the lawn seed standards were established in 1953. A Turfgrass Advisory Service for golf courses was started in 1932 for clubs of New Jersey and the Metropolitan Golf Association, that included Long Island, Western Connecticut, Westchester County, and Rockland County, NY. Dr. Ed Evaul left the turf program in the early 1930s to work for the Soil Conservation Service. T. C. Longnecker started as a graduate student in 1935 and performed the turf service work until World War II. John Stephenson, with guidance and assistance from Dr. G. H. Ahlgren, did the turf service work and maintained the plots for several years during the war. Dr. T. C. Longnecker, who started with the turf program in 1935, returned to his pre-war position in 1946. The 10-week winter turf course was started that same year. In 1945, the turf tournament was proposed by Carlton Treat, golf course superintendent at Montclair Golf Club. This program was promoted for a period of years by Dr. Ed Husted of the New Jersey Golf Association and Mr. Eugene Larkin of the Metropolitan Golf Association. Following Dr. Longnecker’s leaving, Ralph Engel started as the fourth full-time turf professional at Rutgers. At that stage, the position became half-time Extension. The remainder of the position was still supported in part by turf service and private funds. The Turf Short Course continued as a five-day course from 1929 until 1957 except for three war years. In those earlier years, 32 hours of lectures were given for the week, and sessions often ran from 9 to 5 o’clock. The turf and agronomy staff gave all the lectures (none by turf growers or industry experts). The group was divided into Lawn and Utility Turf and Golf and Fine Turf in 1952. This division of sessions has continued into the current New Jersey Turfgrass Expo program. Following discontinuance of the 10-week turf course in 1958, demand persisted for renewal of a long-term course. The two-year course was started in 1952 as a result, and continues today. This course is filled to a capacity of 60 students each term. Seed mixture studies which showed the difference in seedling competitiveness. This study aided in formulating seed mixtures. The first maleic hydrazide treatments which showed strong activity on turf, but great differences in species. Turf cultivation studies showed the primary values are thatch control and seed introduction. Earliest tests with methylarsenates for crabgrass control. Earliest studies with dicamba for chickweed and clover showed the 1-2 lb. rates proposed could be lowered greatly. Early observations on chlordane insecticide plots in crop studies showedcrabgrass was inhibited. This and a Wisconsin greenhouse study led to more chlordane research and use of chlordane at herbicide rates for crabgrass control. In this same period (1959), CDPA and Zytron, which had been formulated for crop science herbicides, were tested on turf for crabgrass control. The Turfgrass Advisory Committee gave counsel on the Research-Extension program and was the catalyst in developing the Turfgrass Extension Specialist position, which was first filled by Dr. C. R. Skogley in 1956. Dr. Henry Indyk became specialist when Dr. Skogley moved to Rhode Island in 1960. In 1956, the Turfgrass Advisory Service to New Jersey and Metropolitan golf courses was closed when the USGA announced establishment of the Green Section in the Northeast Region. Closing this source of revenue had its good side because it led to funding 100% of the full-time turf position on public money for the first time. The Turfgrass Advisory Committee served to establish the importance of turf with the adminstration of the University. This led to a turfgrass breeding position, which was filled by Dr. C. Reed Funk in 1962. Manhattan ryegrass and the first manmade hydrids of Kentucky bluegrass (which have meant so much to New Jersey turf) developed from this program. A sod grower, Wiley Miner, proposed to Rutgers University that New Jersey certify sod grown in the state. Dr. Indyk, Roy Atkinson, and other members of the NJ Department of Agriculture and the Agronomy Department of Rutgers University developed in 1963 the first certified sod program for cool-season grasses. The first of this sod was cut at LaBarre and Schuck Turfgrass Farm in Millburn in the fall of 1964. In the late 1960s, there was a strong desire to reactivate the Turfgrass Advisory Committee that had discontinued meeting due to a loss of personnel. During one of those meetings, it was proposed that the newly organized committee should become a membership organization that served the turfgrass industry directly as well as advise the program at Rutgers University. This led to the founding of the New Jersey Turfgrass Association as we know it today. Various comments and discussions led to a scheduled planning meeting for a turfgrass association after the Turfgrass Research Day on June 11, 1969. Of the ten invited, Dan Brogan, Leo Cleary and Alex Schaafsma met with Drs. Adams, Engel, Funk, and Indyk of Rutgers University. From this meeting, the first organizational meeting was scheduled for the evening of January 22, 1970. The main thrust of the meeting was a review of all the turf interests and representatives who might be interested. The group had such a good time that they forgot to record those in attendance. The good times, along with postage and other expenses, were ensured by a $100 contribution which was placed in a pre-association treasury. Following this, meetings were held on March 16, April 17, May 25, June 22, June 29, September 30, and November 6, 1970. The temporary officers were Leo Cleary, chairman; Wiley Miner, treasurer; and Roy Bossolt, secretary. 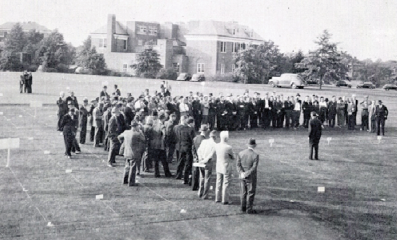 The New Jersey Turfgrass Association was incorporated in October, 1970, and the inaugural meeting was held November 18, 1970 at Forsgate Country Club. The first slate of officers was: Leo Cleary, President; Don Marshall, Vice President; Wiley Miner, Treasurer Eugene Field, Secretary. 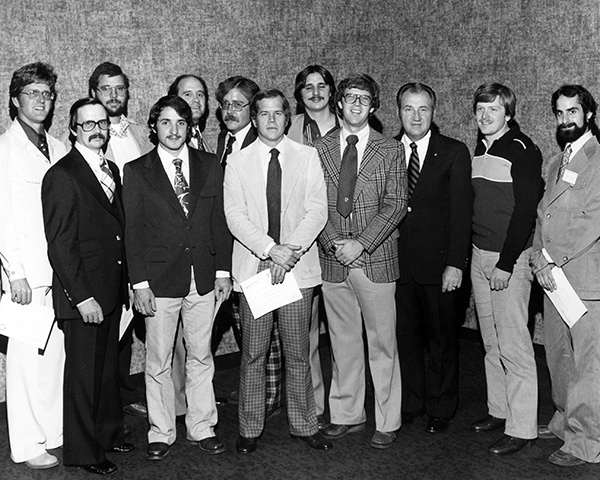 Members of the board of directors were: William Rapp, Ken Morrison, Roy Bossolt, Peter Loft, Anthony Grasso, Al Rathjens. The official mailing address started at Cleary Corporation in Somerset. Shortly thereafter, it was moved to an office in the Montclair Golf Club with a mailbox in Caldwell, NJ. Several years later the office was moved to New Brunswick. The New Jersey Turfgrass Association launched the first New Jersey Turfgrass Expo in cooperation with Rutgers University in 1974. This was a merger of a trade show with the former 5- and 3-day turf courses that started at Rutgers University in 1929. This was the beginning of the Hall of Fame Award, the Achievement Award, and student scholarship awards. Along with these traditions, the Turfgrass Expo served to generate funds to support turfgrass research and provide educational opportunities for NJTA members and others in the turfgrass industry. The above historical overview was compiled by the late Dr. Ralph E. Engel, professor emeritus of Rutgers University.